Declination. 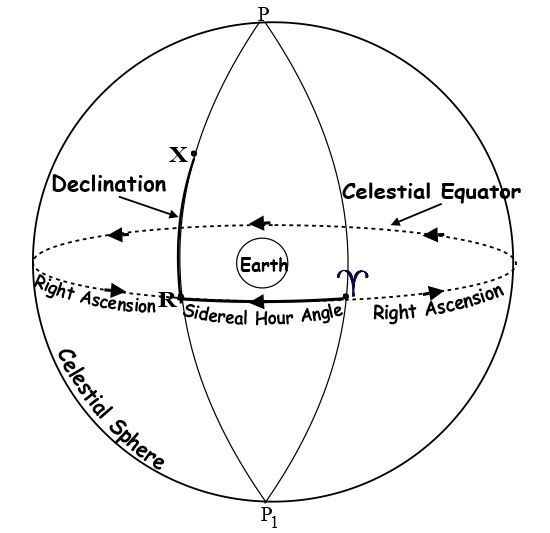 The Declination of a celestial body is its angular distance north or south of the Celestial Equator. The declinations of the stars change very slowly and can be considered to be almost constant for up to a month at a time. The declination of the Sun changes relatively fast from 23.4333.o N. to 23.4333.o S. and back again during the course of a year. The Moon’s declination is more difficult to predict because the rate of change is even more rapid than that of the Sun and the pattern of the changes is less uniform. The declinations of the planets also change rapidly in comparison with the stars.